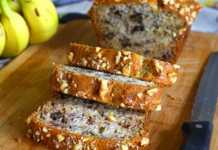 Best Zucchini Walnut Bread: My friend’s family made a quick trip to our city and they didn’t have time to have for lunch/dinner get together. We were just going to meet for an hour or so. Being the baker that I am, looking for opportunities to bake, I wanted to bake something for them. I had a whole bag of fresh zucchinis in the fridge and wanted to use some of it to bake something new. 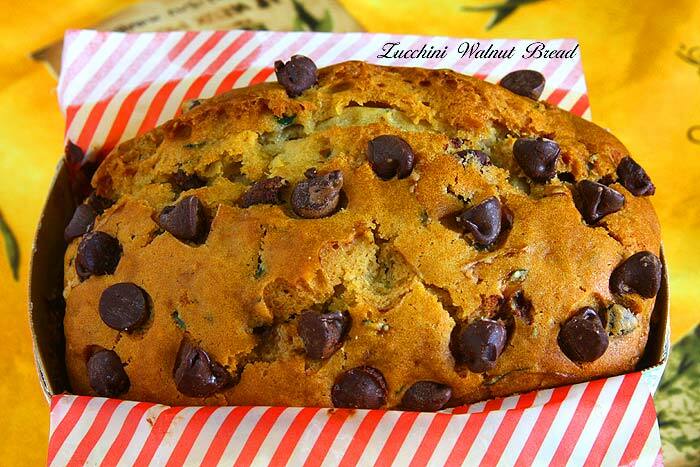 I zeroed it down to zucchini walnut bread. Yes, I have two eggless zucchini bread recipes here already. One is a banana zucchini bread, where I have used bananas as an egg replacer, so the zucchini bread has more of a banana bread flavor and texture. 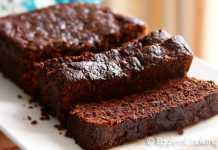 The other one is a chocolate zucchini bread. Even though the taste was great for that bread, I was not satisfied with how it looked. The bread rose high but sank down and looked too flat. So I wanted to try a simple and plain zucchini bread recipe. 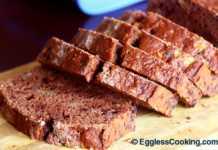 I borrowed inspiration from the vegan banana bread recipe here and a couple of other eggless quick bread recipes in the blog and came up with this recipe for the best zucchini walnut bread recipe. I’m saying that it’s the best recipe because the bread rose beautifully like from a bakery and tasted great too! I also wanted to make 2 variations of the bread having the same recipe as the base by adding walnuts for one portion and chocolate chips for the other. Also instead of baking it as two big loaves, I wanted to bake 2 small loaves of each variety so 4 small loaves in total. 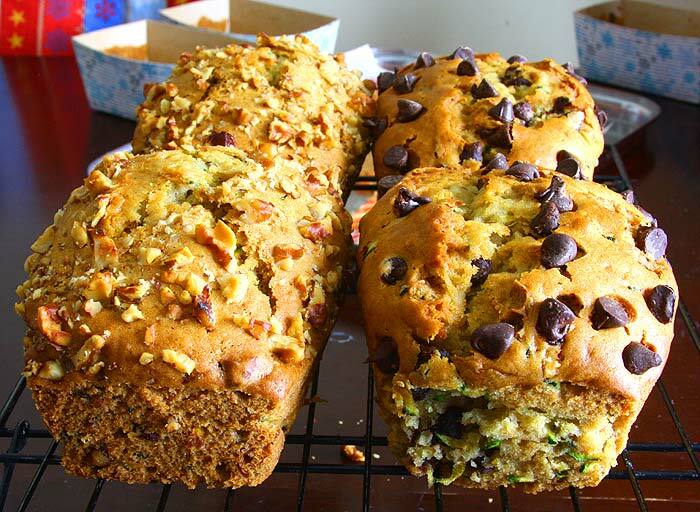 All the changes I incorporated worked out great and the end result was 4 beautiful and delicious zucchini bread loaves. 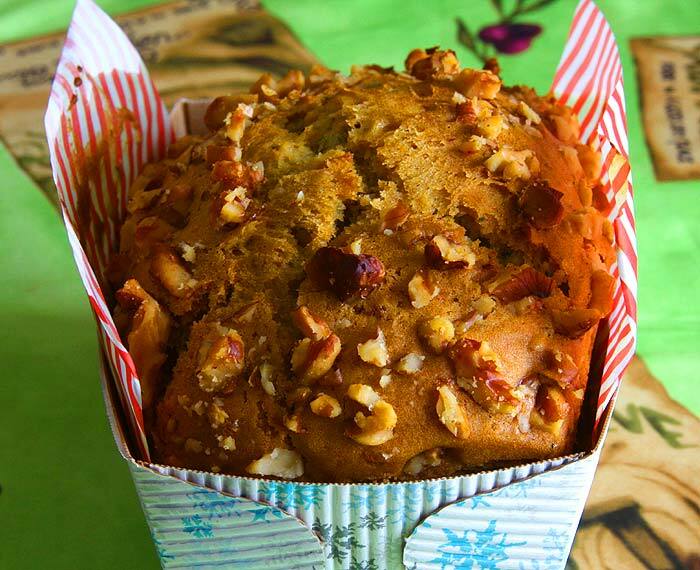 This zucchini walnut bread works great as a gifting idea. 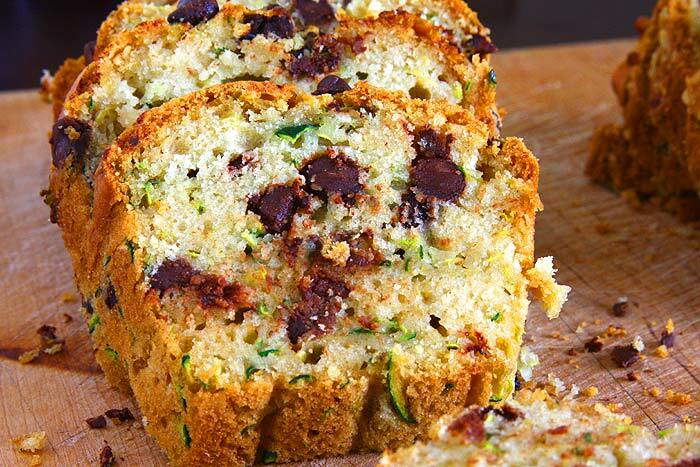 Whether it’s the holiday season or a “welcome to our neighborhood” gift, this zucchini walnut bread and the chocolate chip version perfectly fits the occasion. Preheat oven to 350F/180C for 15 minutes. Line the loaf pan/pans with parchment paper and lightly grease it with non-stick cooking spray. 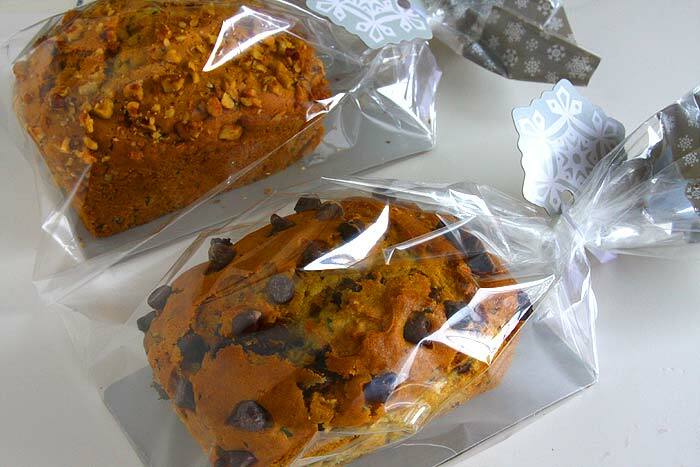 I used 2 mini decorative paper loaf pans. In a large bowl mix together the flour, baking soda, and salt. In a medium bowl mix together the ingredients listed under Part 2. Make sure that there are no brown sugar clumps. Use a whisk to dissolve everything thoroughly. Now stir in the zucchini and 1/2 cup of walnuts. Pour the batter into the prepared pan(s) and sprinkle the remaining walnuts on top. Bake for 35-40 minutes or until a toothpick inserted in the center comes out clean. Mine was done in about 38 minutes. Depending on the pan size you are using the baking time will vary. Remove the pan(s) from the oven and place it on a cooling rack to cool completely before slicing it. 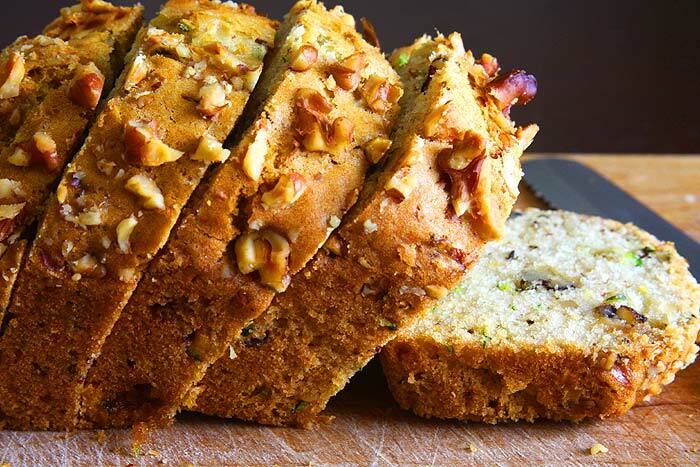 The zucchini walnut bread rose perfectly especially for an eggless bread. As always I left the bread to cool overnight and sliced it the next day and was able to get perfect slices. Quick bread slice well if cut after a couple of hours of cooling. I usually bake it the previous day and leave it overnight and slice it the next day to get neat pieces. For the chocolate chip version of this zucchini bread, I used 1/2 cup of brown sugar and 1/2 cup of white sugar and 3/4 cup of chocolate chips. I used 1/4 cup less sugar than the zucchini walnut bread anticipating the sugar in the chocolate chips but interestingly the zucchini walnut bread tasted sweeter than the chocolate chip version. I got these cute little Christmas themed paper bread pans from Michael’s and used 2 of each for the walnut and chocolate chip zucchini loaves of bread. So 4 mini loaves in total. I don’t know the measurement of these pans. But this recipe should be perfect for a single 8×4 inch loaf pan. Do you make buttermilk with milk and vinegar or yogurt and water? I buy buttermilk from the store. Milk and vinegar is a good substitute as well.